Specialises in multimedia, 3D, animation, web design and graphic design services for CD, DVD, hard drive or print. Based in Sydney, New South Wales, Australia. Provides web and graphic design, e-commerce services, flash multimedia, audio/video multimedia, database design, and hosting. Los Angeles based designer offering multimedia and graphic design for the web, logo design and online advertising. Includes portfolio and information about multimedia design programs. Offers graphic design, web design, multimedia presentation preparation, and related services. Based at India. Multimedia company located in San Francisco that specializes in web design, graphic design, special effects, animation and multimedia. Full service multimedia designer. Services include web site design, logo design, CD-ROM production, CBT, screen savers. Specializes in web architecture and design, banner ads, logo design, print advertising and multimedia. Focus is on tourism-related enterprises. Offers graphic design, web design, multimedia presentation preparation, and related services. Flash presentations and web site design and multimedia. Contact information provided. Multimedia design and programming. Solutions for web, multimedia and print design needs. Web design and multimedia services. Includes a portfolio and contact information. Services cover CD authoring, duplication and replication, web design, Flash, video production, multimedia presentations, and print design. Located in Andheri, Mumbai, India. Specialises in multimedia, 3D, animation, web design and graphic design services for CD, DVD, hard drive or print. Specializing in web design, animation, digital photography, graphic design and interactive multimedia with offices in Prineville and Hood River. Includes company profile, portfolio, FAQs and links. Multimedia company specializes in web, graphic, multimedia and Flash design, print illustration, CD-ROM production, video editing, corporate logo and banner design, and site promotion. A web design, video and multimedia company in Cairns, Queensland, Australia. Specialists in online and interactive media solutions, including web, multimedia, video, and graphic design. Offering site design, multimedia presentations, 3D animation, graphic design, photography, and video presentations. Offers design, graphics, database, and multimedia services. Offers multimedia and applications development along with traditional web hosting and design. Interactive multimedia, corporate web sites, online learning and graphic design. Offers web and multimedia design services. Site includes a portfolio of works. Offers web design and e-commerce, CD and DVD production, and multimedia services. Calne, England, United Kingdom. Offers multimedia and web design, development and hosting. Provides web and graphics design, animations, and multimedia services. Based in West Bengal, India. UK based multimedia agency specialising in providing complete multimedia design/development for our clients. Multimedia consulting including website design, press release distribution, and marketing campaigns. New Jersey-based communications firm specializing in dynamic multimedia, web design, print advertising and animation. If the business hours of Multimedia Creative in may vary on holidays like Valentine’s Day, Washington’s Birthday, St. Patrick’s Day, Easter, Easter eve and Mother’s day. We display standard opening hours and price ranges in our profile site. We recommend to check out multimediacreative.com.au for further information. 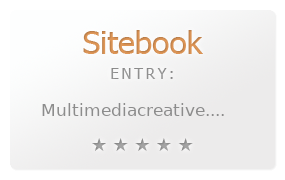 You can also search for Alternatives for multimediacreative.com.au on our Review Site Sitebook.org All trademarks are the property of their respective owners. If we should delete this entry, please send us a short E-Mail.